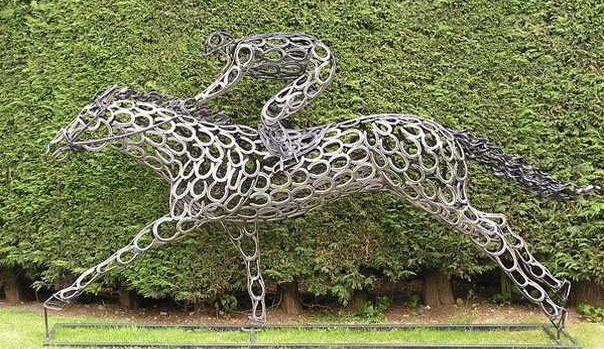 Our friend Jim Jimenez, farrier from southern California, forwarded information from the Horse & Man blog on a sculptor from the UK named Tom Hill. Along with it, came a phenomenal group of images of work he has done using recycled horseshoes and even nails. Click here to see the article and more images. Quite the work, as you can see in these images. 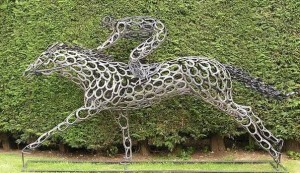 This entry was posted in People and tagged Farrier, horseshoes, sculpture. Bookmark the permalink. Really cool! Nice way to recycle the horseshoes! Quite a creative artist! Absolutely amazing! You really have to admire the attention to detail and incredible likeness. Hi David, Certainly is a tremendous amount of talent at work on these sculptures. Thanks for the comment. Those are some cool sculptures! And it’s a great way to recycle horseshoes and nails too. I bet a lot of people will want a sculpture like these.